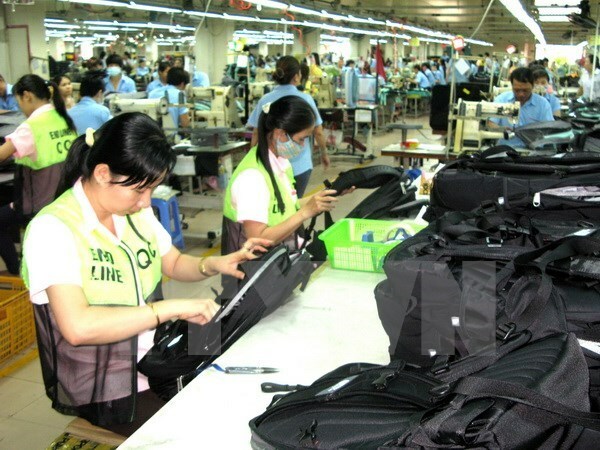 Hanoi (VNA) – The industrial production index (IPI) is estimated to increase by 7.2 percent in November and by 7.3 percent in the past 11 months, according to the General Statistics Office (GSO). The increases in the processing and manufacturing sector, electricity production and distribution and water supply, wastewater and garbage treatment helped offset a decline in the mining sector. Provinces and cities with high IPI growth include Quang Nam (30.6 percent), Thai Nguyen (24.5 percent), Hai Phong (16.7 percent) and Da Nang (13 percent). The inventory index of the processing and manufacturing sector by November 1, 2016, increased 8.8 percent from the previous year but textiles and garment, chemical production and chemical products, electricity equipment production saw the inventory index down. According to the GSO, by November 1, 2016, the number of labourers working in the industrial sector increased 4.3 percent from one year earlier. The State sector has seen a decline of 2.6 percent in the number of workers while the figure of the non-State sector rose by 1.7 percent. The workforce in foreign direct investment (FDI) enterprises climbed by 7.4 percent.